One of my favorite looks that I see people wearing all the time is bohemian. But for some reason it’s always been a style that for me seems a little harder to pull off. Over time though, I’ve realized that the problem lies in me trying to do an entirely boho outfit, rather than just incorporating it into my personal style (which isn’t boho at all). And that’s the key with any style — don’t force yourself to wear a completely different style that doesn’t work for you…just add bits and pieces so it’s not overpowering to the rest of your style! I recently picked up this gorgeous swing top and fringe poncho from Nordstrom Free People, both of which are very boho, and wanted to figure out how to style them in a way that still reflected my personal style, so I tested out my theory in two outfits, one with each of these pieces, and love how they turned out. So today let’s talk Bohemian. 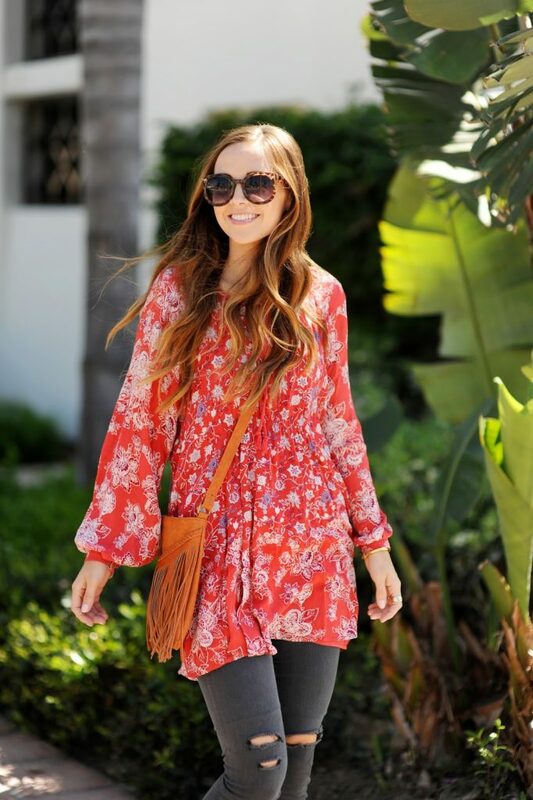 Here’s 4 easy ways to incorporate boho into your look, without it overwhelming your style! 1. Add a flowy garment. Loose and flowy maxi skirts and dresses, ponchos, swing tops with loose, flowy sleeves — they’re all very boho. To incorporate it into your style, pick one of these styles and add it to the rest of your style. I paired a beautiful flowy swing top with skinny, distressed jeans and strappy ankle boots for a good mix of modern and boho. If you choose a boho maxi dress, pair it with modern jewelry and shoes. 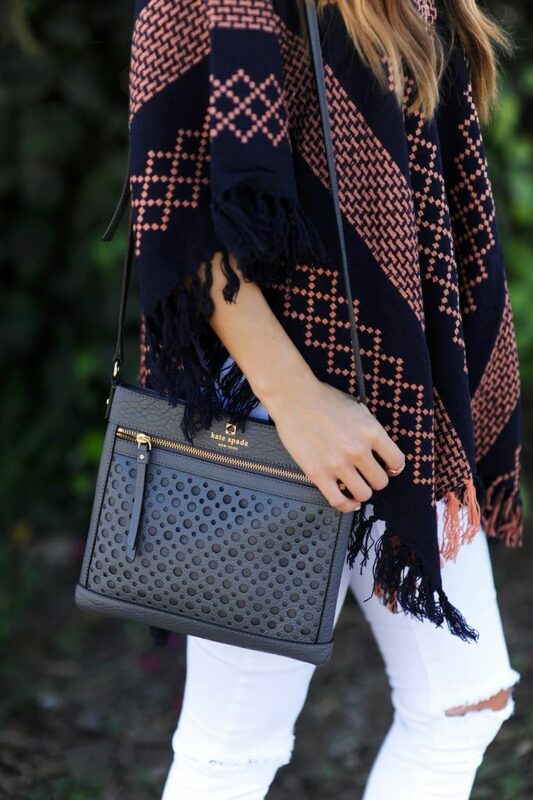 Or if you try a poncho, add a feminine bag and heels to keep the outfit more your style. 2. Try earthy colors. I definitely gravitate toward bright and fresh colors, but boho is all about earthy tones. Since I don’t want to steer too far from my personal style, I choose pieces that had those earthy undertones, but still were vibrant and colorful. Even the navy poncho has some beautiful, bright embroidery that keeps it fresh and modern. 3. Don’t forget a hat! Fedoras and floppy hats are both very boho, and instantly add a bohemian vibe to your look. This is also such an easy way to add a bit of boho without overpowering the rest of your style. But I personally like to add them to an outfit with an already slightly boho vibe so the hat doesn’t seem out of place. 4. Add some fringe. Fringe is huge this year, and definitely very bohemian. 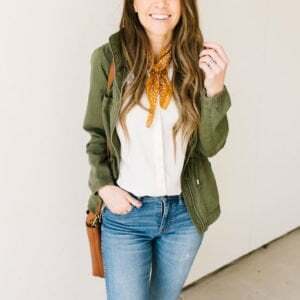 Add a little fringe bag, a fringe kimono or poncho, or a fringe lined blouse and your outfit will get a taste of boho without overwhelming the outfit. Just make sure you pair it with other pieces that fit your personal style! So do you think you’ll try out the boho trend?? Find more of my favorites right in the widget below — click the image to shop! Wow! 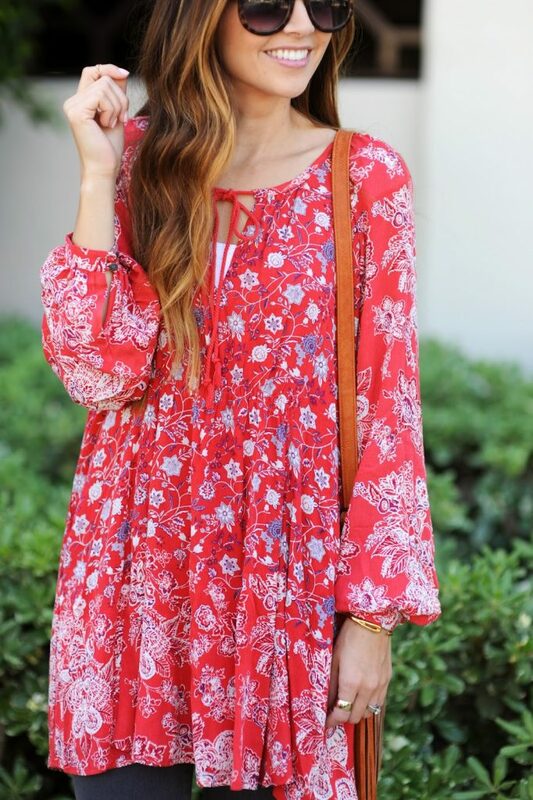 Both outfits are pure boho perfection! I’m esp. loving this red blouse!! Love this! And I love your red tunic! That red dress is gorgeous! Such great inspiration! LOVE that poncho!!! I have a poncho but it is open in the front. I love the idea of just a pull-over like this.